I have a deep appreciation for architecture, and a sincere admiration for those who design and create spectacular homes. Through my blog, I have found quite a few kindred spirits who love architecture as much as I do. One of these kindred spirits suggested that I begin a series in which I interview architects and architectural designers and get their perspective on what is happening in the architectural scene of the 21st century. The first architectural designer that I am profiling is based in Atlanta, Georgia. His name is William T. Baker, although he goes by Bill. Whenever I see a 'William T. Baker' sign up on an empty lot or on the lawn of a home that is being renovated, I know that it is going to be a spectacular project. Bill is known for his classic style and exquisite attention to detail. He is extremely versatile and has one of the best eyes for scale and proportion in Atlanta. It is interesting to note that designer Suzanne Kasler, who also has an amazing eye for scale, proportion, and detail, selected William T. Baker & Associates as the architectural firm on her recent remodel of a classic 1930s Buckhead estate. The following contains the questions I posed to Bill, and his beautifully worded answers. Interspersed with the questions are examples of some of the houses that have inspired him, as well as examples of homes that he and his firm have designed over the past 20 years (unless noted as otherwise). Q: How did you decide to pursue a career in architecture? A: In retrospect, my childhood was very rich visually. My father was a nationally acclaimed furniture designer, and I would watch him draw his designs on thick ivory-colored paper at his drafting table. Sometimes when he would let me, I’d climb up onto the tall wooden stool next to his chair and trace around his French curve templates or carefully inscribe circles with a compass. I developed a love for drawing and an eye for detail at an early age. My father taught me how to draw cubes and rectangles in three dimension. In fact, I was the only child in my kindergarten class who knew how to draw objects in perspective! By the time I entered second grade, I was able to sketch a farmyard scene and show the barn in correct perspective with its shadows. In 1975, I enrolled at Auburn University planning to major in architecture after my second year. This seemed to be a good plan given my lifelong love of architecture and the artistic talent I had demonstrated. However, I was disappointed to find that the curriculum had largely abandoned its classical foundations and had embarked on a new aesthetic direction that didn’t appeal to me. Furthermore, during my sophomore year, many of the graduating architecture students began sharing stories of firms laying off architects rather than hiring new ones. The country was still reeling from the effects of the Arab oil embargo, inflation was rampant, and construction-related businesses had few entry-level openings. So, I declared a major in business finance, thinking this would result in better job prospects. After graduating in 1979, I found that the prolonged recession had affected the job market for business graduates, and my best efforts were for naught. I was in exactly the situation I had hoped to avoid! I accepted a job selling insurance but this company soon went out of business. My career seemed to be off-track, and I searched for a new direction. During this time, I received an unexpected and much-needed word of encouragement. I casually mentioned to someone that if these were the best days of my life, as the old saying goes, then I was in trouble. This wise person responded, “The early years of a young person’s life are not the best years, but rather the most fun. The best days are still ahead.” I held onto these words as I wondered what the future held in store for me. Like many of my peers during this time, I applied to a graduate school of business to earn a master’s in business administration. Surely with an M.B.A. from a good school, I would have success securing a better job. But, shortly after applying to Vanderbilt University in Nashville, a chance meeting completely changed my plans. On a whim, I went to see an executive recruiter to find out which major within the M.B.A. program was most in demand. He confirmed my strategy of pursuing a graduate degree, but suggested I attend Emory University in Atlanta. He said registration for the fall class was still open and that I should apply immediately. This short conversation would impact the course of my life in a way I could never have imagined at the time. Moving to a large city where I had no family contacts and I knew no one was a daunting task. But I had the hope of a new beginning and new opportunities. My spirits were high as I entered the fall class of Emory’s Graduate School of Business in 1980. This beautiful home was an award winning design for Bill Baker. I admire it every time I pass it, and sometimes plan my daily dog walks so I can walk by and admire the home with the morning light shining on the front. Q: How did you make the transition from Business to Architecture? A: After graduating two years later, I obtained that all-important job for which I had worked so hard. As an in-house consultant for Trust Company Bank, I was engaged in projects for senior executives that allowed me to see many sides of the banking business. I was promoted to officer of the bank after one year, but something wasn’t right. My first love was still architecture, and deep inside I knew that I was wasting my real talent. I was restless. One morning in the summer of 1984, the major Atlanta newspaper ran an article about a local real estate developer, Martin Marchman. He was making a name for himself by building million-dollar speculative homes. This was the first time the city had seen anything like this on such a large scale. Job growth among Atlanta’s corporate community was strong, and Marchman was building new homes to meet the needs of the Fortune 500 executives moving to Atlanta. Suddenly, I had an idea! Why not contact Marchman to inquire if I could work for him as a business consultant? At least that way I could be around architecture. Marchman suggested that I might work in his in-house architecture department, which was run by Steven Fuller. After meeting with him, Fuller decided the best fit would be for me to administrate the architectural control committees for Marchman’s numerous subdivisions. I was happy to accept the job and began to learn all I could about reading working drawings and the construction of houses. I could not have asked for a better education than the one I received in my daily conversations with builders and tradesmen. My job was to confirm that the houses were being built according to the approved plans. When I would question why a particular detail didn’t look like the approved plan, the builder or carpenter would review the drawings with me, and in some cases, thank me for my keen eye. In a very short period of time, I learned a great deal about construction drawings and developed a respect for the people in the field who are responsible for turning those drawings into the reality of a finished home. Back in the office, I got to use my drafting skills. I received the necessary critiquing to help me develop good lettering and line quality. Within a couple of weeks, I was able to draw exterior facades and make revisions to floor plans. I learned the fundamentals of dimensioning and standard sizes for doors, windows and plumbing fixtures. I enjoyed drafting and practiced in the evenings to further develop my skills. By the end of the first year, I moved on to begin a consulting business administrating architectural control committees for developers in Cobb County, Georgia. The builders and real estate agents in these subdivisions sought my opinion about ways to improve the layout and overall aesthetics of their plans. My suggestions were well received, and I was asked to revise kitchens, bathrooms and exterior facades. Wishing to gain even more knowledge, I studied Edward Muller’s classic textbook Reading Architectural Working Drawings, memorizing the terminology and construction standards. In addition, I retained the services of a structural engineer to help me properly detail my foundation and wall sections. My reputation grew, and within the year, I was drawing complete home plans. These early houses were relatively simple, but they were perfect for my level of experience. The knowledge I learned from the builders, combined with my self-study and inherent abilities, allowed me to succeed. I remain indebted to those first builders who gave me the chance to prove myself. Q: What has inspired you as a designer? A: We lived in a beautiful Georgian-style house that my father had built in Nashville, Tennessee. It was full of details that caught the attention of my young eyes. Whether it was the graceful curved staircase in our foyer or the dentils in the paneled library, the unique details of this house always provided me with something of interest to contemplate. My hometown of Nashville was filled with important architecture. My parents and I visited Centennial Park, where I climbed the oversized steps of its replica of the Athenian Parthenon. I was impressed by its huge bronze doors, painted friezes, classical statuary and the grandeur of Greek architecture. It was a most memorable introduction to classical architecture. When I was a teenager, I had the pleasure of visiting Cheekwood, one of America’s great treasure houses. Built in 1929, it was like a grand dame sitting high on a hill, overlooking the rolling hills and meadows of the surrounding countryside. My interest in this house consumed me for years. It was so large, so exquisitely designed, and so perfect in its setting and gardens, that I found myself exploring it whenever I could. I eventually served as a guide for the Nashville Public School’s Christmas tour of Cheekwood. I took great delight in opening the children’s eyes to the things that made the house so special. I wanted them to leave with more than just the memory of the seasonal decorations. I wanted them to recognize an egg-and-dart molding or a Palladian window. I knew firsthand the excitement that could come with an early love of exceptional architecture. Cheekwood, the limestone mansion in Nashville that was modeled after the grand English houses of the 18th century, was an inspiration for the young Bill Baker. Q: What is one of your favorite styles of architecture? A: One of my favorite styles of architecture in America is 18th century French Colonial. About a century after the English had begun to settle the Northeastern territories, the French were busily populating the rich agricultural lands along the great Mississippi River and establishing what would become the port of New Orleans. The Frenchmen who settled these lands in the 1700’s built cottages that differed from their New England counterparts in several distinctive ways. These houses usually had hipped roof with extended porches. In addition to hinged casement windows, these homes have double French doors opening out onto the porches. Because heat, rather than cold, was the environmental challenge of this region, windows were larger and doors more numerous to aid in the ventilation of the interiors. The chimneys were still centrally located within the plan, but are not as massive as those of the Northeast and Virginia. These colonial French homes were often raised above the ground in order to avoid the dampness of the soil. Sometimes, the main floor is raised a full story on wood or brick piers with the resulting lower level devoted to cooking, storage, and servants quarters. Two good examples from this period are the Bolduc House (1785) and Amoureaux House (1792) of Saint Genevieve, Missouri. The floor plans of these homes range from two rooms with a central chimney to the more elaborate center hall plan flanked by rooms of equal size on both sides. In this later plan, the chimney moves to the outside walls and is duplicated in each room to provide warmth in the short winters. An example of this form is illustrated in the Felix Valle House (1818), also of Saint Genevieve. While the majority of these homes are wood clad in cypress, others have masonry walls clad in concrete or tabby stucco. The roofs are generally of a less steep pitch than those of the Northeast and have deeper eave overhangs to cast shadows in the hot summers and throw the rain water away from the foundation. In more elaborate homes, the columns of the porches were built of brick and veneered in stucco and white washed to resemble the columns of the classical orders. Colonial French architecture was conscious of the classicism of France but tended to express it most frequently in the columns of the exterior porches rather than in elaborate door surrounds or entablatures under the rooflines. Q: What type of projects do you work on? A: I concentrate on designing modern classics, whether they are houses, furniture, books, and, more recently, interiors- all of impeccable taste and quality. These two factors – taste and quality- are the keys to my success. Above all, I design for the consumer’s needs first, not my own. I approach each design as a unique expression of artistic merit. I feel confident that my reluctance to follow the latest trend has positioned me for these lean times because my designs are timeless and will hold their own. A recent renovation project by Bill Baker; the home was taken down to the studs, and the exterior was completely transformed. I love the classic details such as the portico, the gable, the trim above the doors. A: One of my most interesting projects right now is a five unit townhouse group at 39 West Wesley Road NW half a block off Peachtree Street in Atlanta. The façade of the building is made up of hand-carved limestone and brick with a slate roof in the style of a Regency period building. It is an excellent example of the type of building that makes a smooth transition from a high-rise urban corridor into a residential neighborhood. The detailing and scale of the building is of a very high caliber. Another project of interest is the house located at 1795 West Wesley Road NW. This charming New England shake style home has been chosen to be the 2009 Christmas Show House benefiting the Alliance Theater. In addition to these projects, we are working on two equestrian estates, a remodel of a historic Druid Hills home, and a new home to be built on the lake at Reynolds Plantation. Even in this challenging economy, some people are taking advantage of the downturn to build now. The Connecticut Back Country style home designed by Bill Baker is going to be the Atlanta Homes and Lifestyles 2009 Christmas House. This AH&L showhouse is always my favorite showhouse of the year, and this year's showhouse features a top notch roster of talent, including Suzanne Kasler, Phoebe Howard, Bob Brown, John Oetgen, Beth Webb, Barbara Howard, and Mimi Williams (for full list, please see the AH&L blog). The home is on the market; to see the listing, please go here. Q: What’s something you shouldn’t skimp on when designing a home? A: Families should always concentrate on getting their room sizes correct from the beginning of the project. That is the one thing that can’t be changed later once the house is built. There’s nothing more tragic than seeing a family undersize their home only to find that it doesn’t meet their needs later. This is the one area I always encourage my clients not to skimp on. This home was completed recently, and is one of my favorite Bill Baker's designs. So lovely is the home, and so well designed for its lot, it elevates the entire feel of the neighborhood. Q: Is there a fad you hope you never see again? A: Yes, the houses built in the 1950’s and 60’s that we refer to as “Ranches”. These houses, for the most part, have proven to be a design that has not stood the test of time. Their floor plans are inevitably obsolete for today’s lifestyle with their low ceilings, small bathrooms and closets, and kitchens usually located on the front of the house. Who thought that was a good idea? Over time, these houses are torn down rather than remodeled. As such, they have proven to be the ultimate anti-green architecture as the resources used to build them end up in the local land fill. Homes designed by Bill Baker and his team always seem to work so beautifully with the specific features of their landscape, and because of this they never look forced. This beautiful home sits atop a crest, and fits in so well to the curves of the lot. 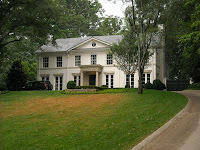 The landscape design is by LandPlus, one of the premiere landscape architecture firms in Atlanta. I hope you enjoyed this interview with William T. Baker, Principal of William T. Baker & Associates, an Atlanta based architecture firm. As you can see in example after example contained in this post, Bill Baker's designs are classic and timeless, rooted in the architectural principles and details that stand the test of time. For more information on his firm, please see his website. Bill also has a blog with a lot of interesting perspectives on architecture and design. What a wonderful interview, so insightful! Thank you for taking the time to undertake this interview project, I find it fascinating. Wow, this is the most in-depth design-related interview I've read in a long time!! I'm really impressed with the thoroughness of Mr. Baker's answers to your questions. He really gives us a great glimpse into the world of architecture in general and his own world in particular. Absolutely love the stone homes, especially the last one. Wonderful, detailed interview! Well done! Such gorgeous homes where you are, one has to travel far from here to see that! Great interview, hmmm, I just realized i am not getting your updates via email, somethings up! Wonderful interview. Someone needs to start paying you for all these wonderful articles! And I echo Bill's sentiments re. ranches. I just don't understand the appeal of 8 foot ceilings (always something that bothered me about Wright's home as well). They also eat up a tremendous amount of land for the amount of living space -- great if you have, say, a ranch, but not so great if you're living in the city. Thanks so much. I like that that Mr. Baker is a designer - degree or no degre, (like Rodney Cook also in Atlanta). If you have the design talent, it's great for you and your clients to have a business and financial background as well. It's great to learn about Bolduc House, Amoureaux House, and Felix Valle House. Meadow Nook at East Lake the only thing like them around here. I know there are many ordinary 60's ranchers but I grew up in a great 60's rancher. It's not what they are building today though. There are good reasons to vary ceiling heights in a house. I am covering an architect tonight too whose work was really staggerinly beautiful too, we must be on the same wave length today. I know many people who move into 60s ranches, fix them up, and happily raise their families there. There is a neighborhood in Buckhead called Kingswood that is almost entirely 50s/60s ranches on 1 acre lots - wide rather than deep, so there is a lot of space between the neighbors. Kingswood was built as a grand neighborhood in the 50s/60s (still is), so the ranches were larger (most are at least 3000sf) and more sprawling, and many of them have 10' or 9' ceilings. It is rare for one of these ranches to be torn down - nine times out of ten they are renovated - as the cost of the land is so high. There are a lot of ranches in Atlanta, though, that were built on .75 - 3 acre lots that are just not designed well - the homes are not functional for these times, they are not aethetically pleasing, and they are not practical for such desirable locations and lots. I see these torn down all of the time - and this is probably what Baker was referring to. This is a most interesting post and confirms many a prejudice, positive and negative, I have about contemporary house design. All are beautiful, undeniably, but the one I'd love to reproduce is Bolduc House, St. Genevieve, Missouri. Somewhere, on a wooded-lot outside the city, perhaps in the mountains - made of stone and wood with an utterly contemporary interior comfortably furnished without any of the usual design cliches. Thank you for this post. BTW you were mentioned as a blogger yesterday as I visited Mrs. Howard and Max & Company. I enjoyed this post on Mr. Baker. I was really surprised to see these homes from St. Gen. I grew up 30 minutes from there and have been there many times. It really is a small world. I honestly know zilch about architecture but I love looking at houses, always have. Bill Baker is amazingly talented, but he also seems like a very nice, obviously approachable, honest man. This is a great interview! I adore some of these homes and could look at them forever. The Christmas House 2009 is breathtaking but my favorites are the house you walk your dog past and the house that was completed recently. I think they are exquisite. My brother, Patrick Carmody,(www.patrickgerardcarmody),is a gifted residential architect in NYC,designing country homes and gutting and re-designing brownstones for many notable people.One of his rooms was recently featured in Metropolitan Homes Showcase home for SHOWTIME.He graduated from Rice University many years ago, and hails from Louisiana, and there is a strong southern classical aesthetic in his work.I encourage you to look at his website...it's stunning! Atlanta is a fascinating place - one can live just minutes from the heart of Buckhead (considered to be prime real estate in Atlanta, and where many of these homes are located) with all of its world class shopping and dining, and live on a horse farm with 10+ acres. There are also areas of Buckhead where most of the properties are 2-3 acres, and there are other areas that were built up in the 20s-40s where the lots are smaller, but the homes are unique and very exquisite. I frequently show such large homes on my post, but it would be interesting to highlight some of the other areas of Buckhead! Given that there is a fair amount of land in Buckhead (although most of the lots already have homes - the number of houses in Buckhead does not change year to year as most new construction takes place on lots where a home has been torn down - infill, I think they call it) - there exists the ability to build these very large homes, and they are not McMansions fit onto a tiny lot, they are estate homes that are on large lots. There is a difference, I think. However - I wonder whether the trends will be changing. My ideal is to have a good size lot, but a house that is manageable both for now while I am raising my young children, and for the future when they are in college and beyond. I have noticed that some of the top architecture firms in town have started to place ads in AH&L with smaller homes pictured. I recently noted that a 2 acre lot had sold, and the owners plan on using one of the top architects in town, but want to build a smaller size home - a beautifully crafted, beautifully built home - but about 3000 sf (which is not large for Buckhead). Helen - thank you! I too am a Rice University graduate, and had many friends who were 'archies' (as the architecture students were called - I was an 'Academ', a liberal art student). I am going to look at his site right now! What a wonderful interview and an inspiring story about William T. Baker. I am fascinated about that moment for each person when the door opens and the future walks in. On paper Mr. Baker's career plan would look deliberate, totally controlled. In reality, it is more circular, more intuitive, more drawn by the heart. Having both of these qualities makes him the comprehensive architect: meticulous and artistic. His homes were a joy to view. My heart was taken by the stone house. You did a thoughtful, insightful and knowledgeable job on this. What a lovely interview. I have long been an admirer of Bill Baker's work. It is wonderful to hear his story. * Ah yes, the uber-talented, always-a-gentleman Mr. Baker can design OUR home ANYTIME.... (Oh, that he WOULD... Oh, that we COULD retain him!!!)... He's as fascinating as every single one of "his" homes!!!! There is a French / vernacular / low country (whatever) with a huge sun sheltering porch in Brookhaven, a high-style vernacular. It's the house in the neighborhood I most want to approach. It was such a fascinating interview and the photos were breathtaking. Oh my, this is one of the most delightful interviews I have ever read. I find it so amazingly comforting to know that even people like him got lost on their career path and managed to find their way back on. I got down the engineering path quite by accident and daydream every day about finding my way back onto a design path. I have even thought of going to study architecture but I think my love is more for interiors. Although when I look at his homes, I realize it is really all about the architecture. We live in an area that doesn't have great architecture and so I think one naturally focusses more on decoration, as it is all one can control in a little suburban house! Although I do love his comments about the size of rooms and scale. Any house, of any size, can be done right. I have been in small old homes that have wonderful flow and light and detail, even if not enough closets. It really is an art to design a perfect home, and one that seems to be sorely lacking except perhaps at the higher levels where Bill is working. I am always so frustrated to see new homes that are so ugly and so poorly laid out. But his work is exquisite and I wish I could afford to hire him! I have been doing a lot of self-stufy on furniture design and it is opening my eyes up more to archtictural detail, as I am realizing now that a lot of early furniture detail was taken from architecture (like egg and dart and other detail and friezes and whatnot). It is all a fascinating world and I am so glad you're writing these rich and interesting posts. They really are a lifeblood somedays in this boring town!! I will check out his blog - you are right - his houses seem to really grace the land and don't seem indulgent or stick out like a sore thumb! They are classic and elegant and refined and I am so happy there are still architects designing "class" and not just trying to be weird and different. There is something to be said for classic beauty. Wonderful interview.. Can I move into the French enfilade house? that's my favorite, of course! What a thoughtful man he is. I love how his own house was an inspiration. Of course mine was a ranch so that's out of the question. Loved the comments on what not to skimp on. Just wonderful, great questions too! Great interview...I am in love with the Bolduc House! Wonderful posting -- and about such a brillant man! Truly magical homes -- and I use the term "home" because these appear to be Homes in the best sense of the word! Another vote for the "enfilade" house! And many thanks for such a beautiful article! He is so talented! Great post! Wow! What gorgeous homes! I've always loved brick homes and these homes are so stately. Nothing like traditional architecture. Amazing Facades and photos! You always find the most gorgeous homes. Wow! Those houses are amazing! Great interview as well. Thank you for sharing this interview with us. As a student of Architecture this was very inspiring. I just found your blog and I love it. Also, I wanted to invite you to participate in my giveaway. It started today and it will go on until Monday. Have a wonderful weekend! Wonderful post, as always! I'm a big fan of Baker's work. Wonderful interview and absolutely gorgeous homes!!! Loved it! Beautiful homes, but I have to laugh about his remark about ranch homes having to be torn down and being anti-green. Does he really think that building mega mansions on large swathes of ground is in any way "green"? He's obviously very good at what he does, but it is not as if he's building environmentally-sound homes for the masses. what a great interview! I have always appreciated his firm's work and have a number of the projects in my clipping files. Thanks -cant' wait for the rest in your series! Those houses are absolutely gorgeous! I wish we could hop on a tour bus and get a tour of each house. OoooOOO, I love the landscaping in that last home. So so jealous!